“The stocking were hung by the chimney with care, in hope that Saint Nicholas would soon be there”! The stocking are finally hung here at StoneGable. The mantel is one the first things I start decorating for Christmas every year but the stockings are one of the last things to be put up! I’ve hung them on the back of our kitchen chairs for years, then on the stairs, but now they are finally finding a home on the mantel! 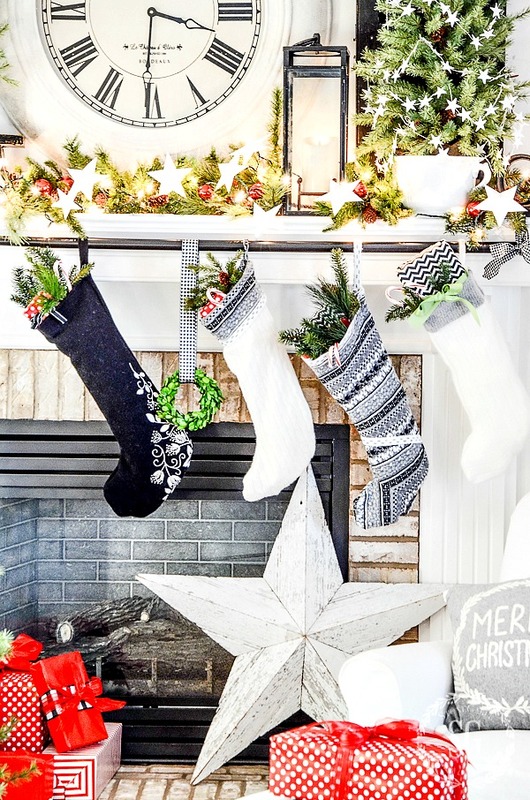 I’ve always wanted to hang stockings on the mantel but couldn’t quite figure out how to keep them up without thumbtacks, tape or gaudy hangers! 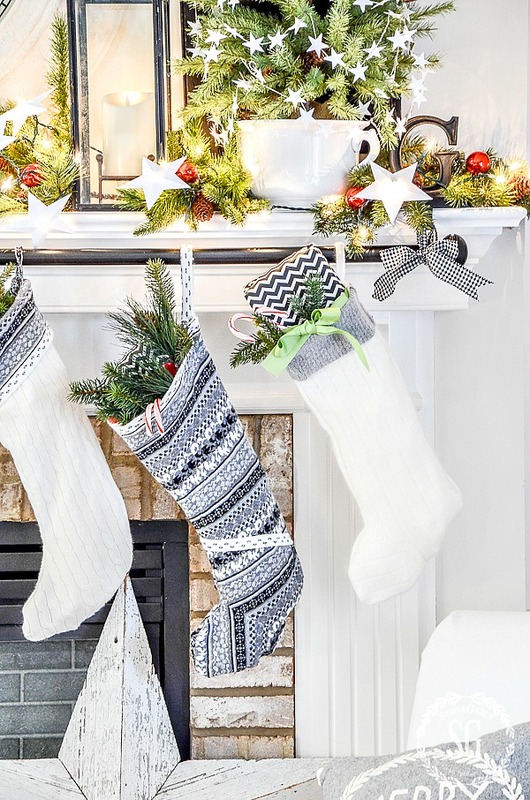 Wait till you see how easy it is to beautifully hang Christmas stockings on the mantel! This year jolly old St. Nick will notice the stockings right away! I’m so happy to have them where they belong… on the mantel! The secret to hanging stockings is to hang them across your mantel on a CURTAIN ROD! How easy is that! Right before Christmas I found two heavy stocking holders at my local Pottery Barn Outlet. One “S” and one “G”… for StoneGable! I placed them on either side of the mantel in between all the greens and little twinkling lights and cut out stars! I bought a curtain rod big enough to run the entire length of the mantel. The color, finish, size and finials are all a matter of personal preference. I chose an oil rubbed bronze curtain rod with simple round finials. I like how the dark curtain pops against the white millwork of the mantel! You know how much I LOVE black and white! To connect the rod to the stocking hangers I zip tied them together. I circled the zip tie around the curtain rod and caught the zip tie on the hook of the stocking hanger. You can wire them if you don’t have zip ties. So easy! To hide the zip tie I tied a black and white ribbon to the rod and caught it on the stocking holder! Smart, huh? One of the added bonuses for using a curtain rod is that you can hang more than stockings on the mantel! A little boxwood wreath makes an unexpected appearance amidst the stockings! Just be careful what you hang from the rod. Make sure the total weight is not too heavy. Santa, when you fill the stockings make sure to take them down! Right now the stockings are filled with paper towels and a few light objects just for fun! Speaking of stockings, how do you like mine? I made them from Good Will sweaters. Each one took less than 15 minutes to make. So easy! Look for a tutorial next week. This is a fun, fun, fun project! If you can sew a straight line you can make a sweater stocking! When the stockings are hung at StoneGable Santa is not far behind! This is a great idea I will try and I’ll tell my son! Can’t wait for the tutorial for making the stockings from Goodwill sweaters! Love the curtain rod idea!! Do you add extra support the S and G to hold the weight? No, they are very heavy. I don’t add anything of heft to the stockings. 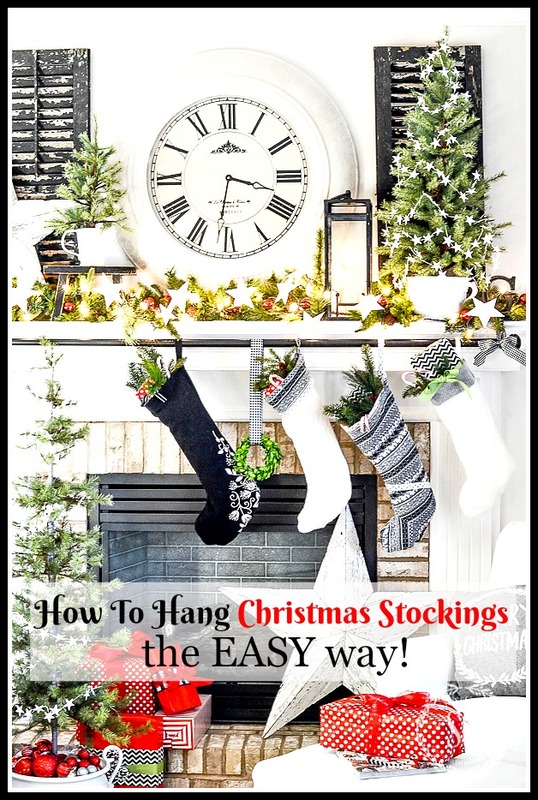 I love this idea for hanging stockings and have done it this way for years. When my husband and I married, we combined a large family. Between us we have four grown children, three of whom have spouses. We also now have nine grandchildren. Each of us has a needlepoint stocking with a different design and our name embroidered on it. I found some metal stocking hangers that are sort of shaped like a shepherd’s hook. The long flat side of the hook rests atop the mantel and the curved side loops down underneath. I just slide the curtain rod through the loop and add a couple of more between the two end pieces to provide support and hang all 18 stockings on it. The weight of it requires that two people work to take them off when we gather together to celebrate and empty the stockings but it holds all of them beautifully and the weight has never been a problem. Glad to see that somebody else has jumped on the bandwagon! Love your stocking hanging idea. I hang mine on wire Command Hooks. Your stockinged are beautiful. Neat idea making them for old sweaters. That is brilliant! Your mantle is beautiful, and homey, just perfect. 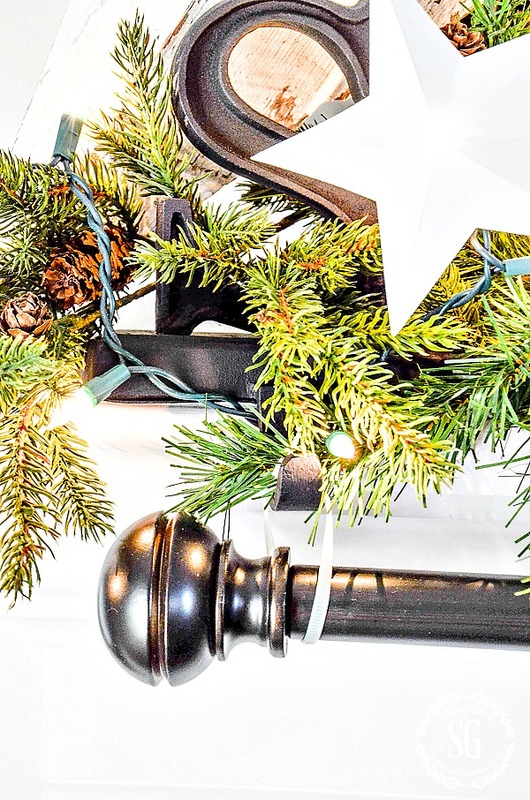 OMG, using a curtain rod on your mantle to hang stockings?…genius. I’m so mad I didn’t think of this myself. I took the idea one step further and installed actual rod hangers (spray painted white) under the lip of my mantle, also spray painted a rod white to hold stockings etc. My rod/holders sort of disappear and can be left up all year…ok, I’m lazy. Thanks for a great idea. Wow, great tip, Johnna! Thanks! Love your stockings! Stockings are one of my favorite articles/décor for Christmas. It’s my kids favorite thing to open on Christmas morning as well. Sewing them from Goodwill sweaters has been on my list to do for years — glad you did! What a fantastic idea! I’ve been struggling with this problem for years and I cannot wait to try this! Thank you for being so clever! Cute idea. I wouldn’t have thought about using a curtain rod. What a practical idea for hanging stockings, I love that! I would not have thought of that but it makes a lot of sense and as you said does more than just hang stockings. Hi Teresa, See my note to Kelly! Yes, brilliant! No fuss, no tools! Also, the sweater stockings look great! Hoping to make room in my schedule this year to post how to make them. I love the rod! I wonder if you could use command hooks instead of stocking holders? I bet you could. Make sure to look at the maximum weight each command hook can hold. It’s on the packaging. Love this idea. Your blog is eonderful. I remember when you posted this idea last year; genius! I love all of your daily articles. Great idea. Looks so festive! I’ve been following you for awhile and have never left a comment. I love everything you do, you’re so creative. This is the brilliant! I keep thinking you’re going to run out of things to share, but you never disappoint! Thank you for sharing your creativity with us. Carol, thanks for commenting! I love all my readers and hearing from you make StoneGable more like a community than just a blog. Keep commenting! Yvonne, that is COMPLETELY INGENIOUS ! I have a pellet stove inserted into a traditional mantle and the top opens to fill the hopper. So decorating the top is a challenge, to say the least. This idea would also allow hanging greenery etc. Your ideas rock girl! Thank you for the details and photos. Your mantel looks beautiful! I would have to agree! Brilliant! ? 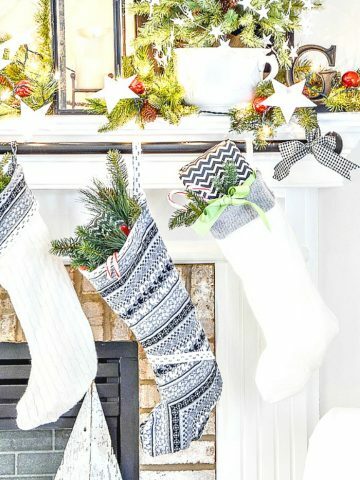 Super clever idea how you are hanging your stockings on the mantle. I like the little boxwood wreath hanging with the stockings. Really looks great! I love this idea with the Christmas Stockings. Just beautifully done and so clever. Love this idea!!! I have patched holes and repainted my mantle more times than I care to mention!!! Wonderful idea and it’s really pretty too!!!! Thanks! I love this idea, who would’ve thought to use a curtain rod. Your little trees adorned with the star garland is darling. Yvonne you amaze me with your beautiful styling and incorporating the hard and soft elements. Loving it ALL!!!! I have been using this method of hanging our stockings for about 8 years or so. Our kids all live far away so when they come, it’s for a week. We hang 10 stockings on the rod! And you are SO right–watch the weight! Last year they were too heavy as we found out the hard way?! A curtain rod! A very clever idea! This is a great idea. I always have very heavy stockings and this will do the trick. You’re one smart lady! I love black and white also! My home and my wardrobe!! I have been doing Christmas with black and white the last few years. Love it! Great stockings! Love the idea of old sweaters. Might have some in my closet…. You have a beautiful Christmas display. Thanks for all the wonderful ideas! 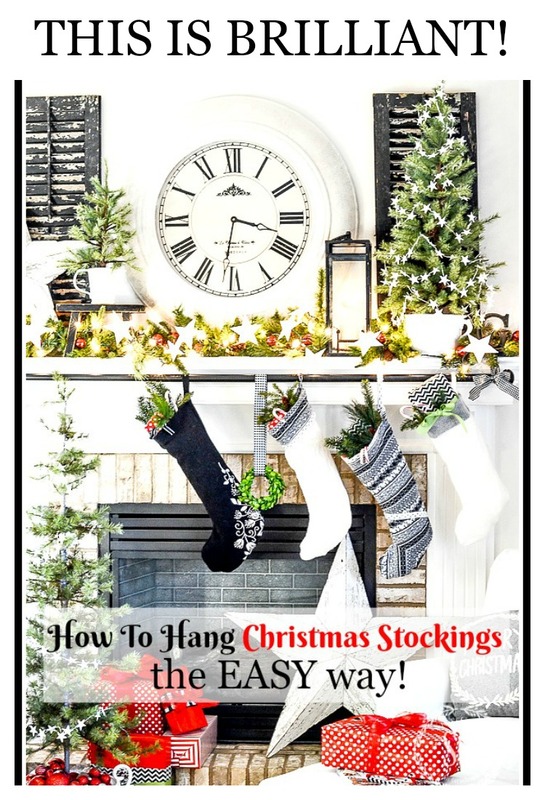 What a great idea – I have been stumped about how to hang stockings properly on our brick mantel – thank you. And I love the sweater stockings!! Love the idea of using a curtain rod to hang stockings. Thanks for sharing. Have a wonderful Thanksgiving!!! 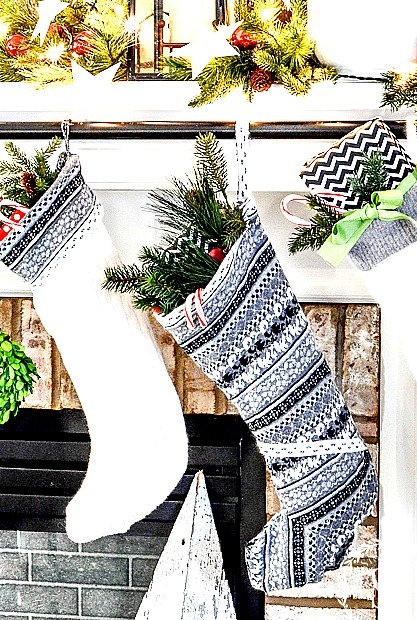 Your stocking hanging tip is genius! I love it! I also love your Goodwill sweater stockings. What a great idea. I needed this post today to feed my depleted mojo. It is just the thing to get me going! Thanks for sharing. Brilliant! Totally going to try this trick! Thanks! What a fab. idea. I love your black stocking with the white pattern on the bottm/side. It’s beautiful. Looking forward to the directions but I think, even I, could do this projet. Thank you. I also liked your idea to use sweater fabric…so many times little presents are bigger than you want but the sweater fabric will stretch out more to accomodate (kinda like my winter pounds. This is ingenious! I love it….so simple and inexpensive and lovely to look at! Thanks for sharing! I’m on my way to shop curtain rods, zip ties, ribbon, and a few goodwill sweaters!!! Wow! I am so inspired! Thank you for sharing this marvelous idea! I’m off to get a curtain rod this morning! This solves a major problem of putting thumbtacks in the mantel!! This is a wonderful idea! I’m sharing it with my neighbor who just had her fireplace redone and has a big piece of reclaimed wood for her mantel. Love this idea. I am starting to see stocking holders with a rod in stores. Clever idea and great that you can customize for the size you want. Kirklands and Pier1 have a couple but they seem a little short. Yvonne, using a curtain rod on the fireplace is such a great idea for hanging Christmas stockings. Thanks so much for the inspiration! My dear, you are a genius! Even though we have lovely stocking holders, I think I will just be using two of them this year! And the sweater stockings? Love those too! Thanks for the inspiration. Yvonne, you always have such great ideas. I bought several sweaters from Goodwill last winter to make pillows, but time go away from me and they didn’t get made. Now I know I’ll be making some stockings also. Can’t wait to get the instructions. What a neat idea! It looks good and practical and so easy. I am always trying to figure out a different way to hang the stockings. Thanks. What a great idea!! And love the stockings you made!! Your entire mantel looks fabulous!! So simply genius!! What a great idea! Your Christmas decorations are beautiful and so welcoming, I always love your decorating ideas! Love, love your mantel. A fabulous idea to hang stockings and cant wait to see the details for making sweater stockings….so cute. Thanks for sharing. Off to find some sweaters so I will be ready for the directions. What a clever idea! I also love the stockings made out of old sweaters. I just retired and have time to start doing some projects like that. Can’t wait to see how it’s done. I just found your blog and really love your ideas. I am not that creative myself, so I appreciate you sharing your talent with us. Great idea ! I’m going to try it on my mantle love how you decorated your room. What an awesome idea! You are incredible!! I can also see using that idea other times as well! Keep those wonderful ideas coming! Fun! LOVE the curtain rod idea for hanging stockings! Every year I dread hanging them, not this year!! Thank you! You are so talented. You always share wonderful and beautiful ideas! Hello Yvonne, I love your ideas! Your so inspiring, I made your Christmas Tree Cheese board for a family party and it was a huge hit and looked lovely – thank you for that idea! Question: I am looking for your tutorial on making the above stockings from old sweaters and cant find it? can you help me locate where you share that? Hi Anne, I broke my ankle and had surgery before I could post the tutorial. Look for it early next Christmas season. What a clever idea!! I’ll even feel pretty clever by copying it! Wonderful idea! I’m doing this! This makes me want to have a mantel! I am going to wee if I can make this work in another spot in my home. What an ingenius idea, did you attach the rod to your mantle or the wall? What a brilliant idea, because I often want to hang varies things on/off the mantal, but refuses to nail into it. Most of the stocking holders tilts forward falling off the mantal. I will give this a try, because its so beautiful, and looks like part of the decorations. Thanks for the great idea. As always, you rocks! Thank you for the idea to make the sweater stockings. This straight line I can do. I love B&W color scheme, too! Also, the rod adds another texture to the room! I love your stockings and can’t wait to see how you made them. They look stunning hanging from your mantel. This is a brilliant idea that I love, but we use our fireplace day and night so I am a little worried that everything in the stocking would get very warm. Do you use your fireplace at all? The beauty of the rod is you can slide the stocking to each side of the fireplace and they won’t get hot. Just make sure this is how it works at your home. Wonderful solution to something that has vexed me for years! And just tonight one of my stocking hangers fell to the floor leaving a small dent in my new flooring! I’m goin to make a small change. Rather than risking another hanger fall, I’m going to use 3m hooks to hang the curtain rod from. I’ll disguise the hooks with ribbon. Stocking issues solved! Thank you, again, and Merry Christmas to all! Great idea, Carrie1 Merry Christmas to you too! Our white knit stockings are getting a fresh new look.. black satin ribbon, fresh pine branches, twigs and maybe glittered bells. Yours sparked a change. Thank You for your many inspirations. I actually saw this on Pinterest a few years back (Indulgy.com) and sort of copied it. Fortunately I have a wooden mantel so I screwed 3 large cup holders underneath the mantle and have those holding my curtain rod. We have 8 stockings now that our family has grown to include daughter-in-law & grandchild & fur babies. What a great idea for hanging stockings!!! I am going to order a rod for next year. Thank you! Thanks for always inspiring me to make our home more cozy and comfortable. You are such a talented and warm person and it shows. Merry Christmas! Awesome idea! Just what I didn’t realize I needed. Love this. I will be looking for stop king hangers I can use on our mantel. Number of stockings are growing with the weddings! I love your posts. So many good ideas. Great idea Yvonne! Love the curtain rod! I ‘”” be trying it. You have really inspired me to make my home beautiful with your fabulous ideas and creativity. I look forward every morning to opening up your blog and seeing what you have to share that day. It is like receiving a gift everyday. Thank you for making my mornings better. Happy Holidays. What a genius idea! I’ve always struggled with decorating our mantel due to it not being very deep. Once you put the stocking holders up there there isn’t hardly any room to hang garland or any other decor behind them. The curtain rod is the perfect solution. Thank you!! I love the lavish and luxurious Christmas decor. Wow! That is beautiful. I love how creative you are. Brilliant !! Love it! Love it! Love it! This idea can be tweaked to fit so many other uses…….. my mind is going crazy !!! Have a Joyous Christmas ! I love all your ideas, and you are so sweet to share with us, I don’t comment a lot but appreciate all your ideas ,love your blog, have a Merry Christmas. Yvonne, brilliant and inspiring! Thank you. Thank you for this idea. I didn’t want to put holes in the mantel and purchasing 5 of those hangers gets expensive. I think this just might be the solution. Υvonne you did it again .what a great idea.I all ways used thumbtacks to hang my Christmas stockings now I’m definitely going to try to hang them your way . Can’t wait for the stocking tutorial…..everything looks beautiful…. Enjoy your blog every morning with my first cup of coffee!!! Truly inspiring, everything is beautiful especially your family room!! Thank you for all the wonderful ideas and items! This is ingenious! So smart & clever. Thank you for the tip. Of course, everything looks beautiful in your Family Room. It all ties together seamlessly. I really had to look closely at the details in the photo to see how you did it. I was admiring your stockings even before I read the post. I love how the stockings are all different but yet carry the same color-scheme and go together. I seem to be forever on the hunt for the right stockings for my family with no success (although I did splurge on a new one for myself from Ballard last year). I’ll keep an eye out for the tutorial next week on how to make the stockings. Wishing you a joyous Christmas Season! Can’t wait for the stocking tutorial! Have been wanting to make some new ones. Wow. What great ideas, Yvonne. Thanks so much for sharing. I almost didn’t read this post….. Hubby and I moved this year and we no longer have a fireplace…..So I decided to have a focal wall that I can change out easily, so I used a oil rubbed bronze curtain rod. And that is where the stockings are hanging. Complete with green garland and tiny battery operated lights….. I’m hanging the stockings from small cafe clips….. though they could easily just slide on thru the ribbon loops. At any rate your post is lovely as always…… and if I ever have a fireplace mantel again I know the best way to hang our stockings. Merry Christmas everyone! I so miss our fireplace mantel. It was so beautiful when the stockings were hung. You have such G R E A T ideas!! Your brain must ALWAYS be in overtime! Always enjoy your blog for the BEST and CREATIVE decor for ANY season!! As always , a clever idea and beautiful decor! What a brilliant idea!! I love all your posts-my favorites are the biblical and spiritual. What a clever idea! Love all your decor, so beautiful. Thank you for sharing? The curtain rod mantle tutorial is genius !!!! 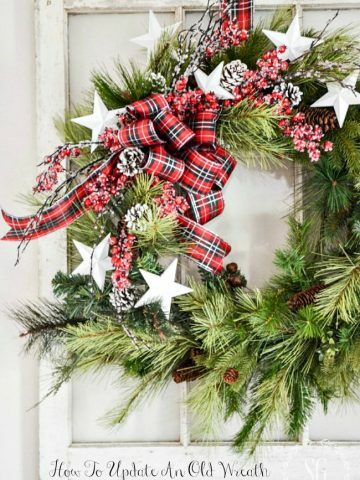 Where do you find the mini boxwood wreaths?? Good to know this is a keeper! Great idea for hanging stockings. Makes it easy to add stockings as family grows. You always inspire me. Thanks. I have never hung stockings on my mantel for all of the reasons you stated. This I should a great idea.? What a fabulous idea. You’re the best ever! Your house is beautiful. Fantastic idea! Can’t wait for the stocking tutorial. That curtain rod for hanging the stockings is pretty darn creative, Yvonne! I don’t have a mantel and I usually hang stockings on the edge of my old up-right piano. I wonder if it would work there. ‘Cause I hate those clunky, junky-looking stocking hangers. And those stockings…I thought they were probably from some high-end store. You are a woman of many talents, Yvonne! Try hanging the rod above the fireplace with commands hooks you can disguise with greenery or ribbon. Or do what my friend does…she has a nice birchwood branch she hangs. Pottery Barn gave us that idea years ago. I love how the little wreath appeared! Why didn’t I think of that? Such a cool idea and so simple. Brilliant, Indeed!! P.S. Can you come decorate my house…….your decorating is beautiful!! For many years I’ve thought I would like a mantle and now I really want one! What ma great idea for hanging the stockings with care! And, I admire your gift for designing the mantle decor. What a great idea! And, your pictures are so clear and beautiful. Loved the sweater stockings and colors and patterns you chose. Your home is always lovely no matter what season. Enjoy your blog daily. That’s a neet idea ! Thank you for giving me so many cool holiday ideas. Black, red and white looks beautiful. This is over the top! I am going to do this as it has always been a big issue as to where to put the stockings! I am also going to start planning for next year as you suggested! All I can say is that you come up with the most beautiful decorating ideas and creative way to do things. I am truly a fan! Really great idea!!! I’ve got to try this!! Oh my gosh! I LOVE your black and white stockings!!!! LaVonne, you are such a gifted angel! Thank you for all your inspiring words and pictures. Such beautiful work! Very cleaver idea for hanging the stockings. I’m keeping this one on my list of to do. Another great idea! My stockings never looked that good! Love the black and white stockings! Great idea with hanging them from the rod. Love the thought of adding as many as you need! Merry Christmas Yvonne! What a GREAT “AHA” idea!!!! Why didn’t I think of that??? So easy to do, and easy to add stockings. Really a good idea for hanging greenery, and other decor as long as it’s not too heavy. It could be finished with paint, or just about anything to match your personal decor. Love these easy, no cost ideas Yvonne. Your site is truly full of them, especially at Christmas. Thank you and Merry Christmas to you and yours. Thats exactly right, Sherry. The lesson is don’t thow it away… paint it! Love the mantle! I am really looking forward to the stocking tutorial. I have an old waffle weave bathrobe I’ve been meaning to make into a stocking, so I will be sure to check back in tomorrow. A very clever idea and I like your stockings I have some old sweaters from Goodwill that I’ve had a couple of years now with the intention os making stockings. Maybe this year I’ll get to it! Perfect solution for hanging the stocking! Merry Christmas to you & your family! Your home makes me wish I could come over for a cup of hot chocolate and sit by your fire! Beautiful and welcoming. I have nine stockings to hang, so this will be a PERFECT solution! Great idea, Yvonne. Thank you! Though I don’t have a mantel, this just may work on my media console! Very pretty mantel, Yvonne. You have wonderful panache and sense of placement. I love the sweater stockings idea! Too cute! Did you have to shorten the shutters? I can’t wait to try this, so excited to read all your creative ideas. This is so clever and I really like the cast iron letters as hangers. I found your lovely blog while reading about KariAnne’s DIY Drop Cloth Wreath. So glad you found StoneGable Karen!!!! Welcome to the family! I absolutely love this idea! My mantle is rough cedar and so hard to hang stockings from and this idea would work so well. Your home is beautifully prepared for the Christmas season. Thanks for sharing with us. Great post, looking forward to the sweater stocking tutorial. The whole mantel is beautiful. Love all the details including the tree! Great post, looking forward to the sweater stocking tutorial! Wonderful idea … I pinned it … Thanks !!! Clever idea. Your mantle looks amazing. Such a clever idea!! I am going to definitely put this on my to do list! Looking forward to the sweater stocking tutorial ! I read your blog every single day. This time you have really outdone yourself. Love the black and white combo. My bookcases and fireplace are the same color as yours. I am going to try your idea. Thank you! What a brilliant idea! 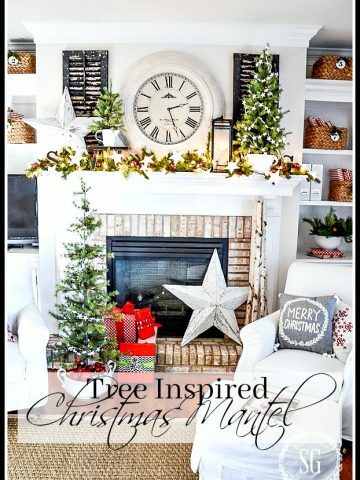 Your Christmas home is gorgeous and inspiring! You are a genius Yvonne! Finally maybe my stockings can be hung! We have a stone mantle. I will check this out! That looks fantastic and very clever. Here is a funny thing. You hang your stockings the same direction as I do. To me the other way always looks wrong. However, I have noticed that in photos whether professional or people photographing their own decorations, they almost always hang them the other way. I was beginning to think I was weird so I am always tickled when I see someone else hang them the “right” way! What a great idea. no nails or tacks to worry about plus it looks great. This is such a fun idea! I have a big family & this is a smart way to put all of my stockings up! Thank you!! You always have such a beautiful home! Love the decorations! Great idea! Love that space. I love Black and White too. You have the best ideas Yvonne ! I have a rustic bar wood mantel and can’t wait to see how this will look! Brilliant idea! I love your home and your blog! I’m a lover of black and white, too. Wishing you and your family a wonderful Christmas season! What a great idea! You never cease to amaze. Love the mantel, too! Love all your decorating ideas and recipes. So smart!! The whole area is beautiful, too. I want to try this! I have a garland hung on the edge of my mantle, and the stockings just seem to be hidden behind it! I could put the rod just beneath it, and they would hang down at just the right place! You are a genius! Easy and looks great! Thanks for the tip. Great idea and beautiful mantle! Using a curtain rod to hang your stockings is brilliant! We do not have a fireplace only a wood stove but I’m pinning this idea in case we ever end up in a house with a fireplace! Such a good idea! Plus your mantle looks amazing! Nancy, I love my pinners!!!!!! Thanks! love all of your ideas!!! I love this idea of a curtain rod to hang the stockings! brilliant! You’re home looks so festive and beautiful!Thanks for sharing your creative ideas! What a fantastic idea! So ingenious, Yvonne! I love the idea of the curtain rod to hang the Christmas stockings! That’s genius! I’m definitely going to use this idea. Thank you. I’m really comfortable with the suggestions you make because they are so easy to imitate! Thanks and….MERRY CHRISTMAS!!! Very interesting. But what I am grateful for this year is your idea about the wooden bowl for cards. My version is ont he table right now! thanks. and yes, I keep some cards to check on folks or hold them in prayer throughout the year. Thank you for sharing your ideas in home decor, recipes and Sunday lessons! Your site is awesome! Update: I didn’t read (just looked at the pictures) and no nails/mantel – yeah – I just showed this to my husband (didn’t even mention nails or no nails) and he LOVED the idea – so we are off to buy it now – thank you so much for the great idea!!!!!! GAILANNE, What an honor that you read my blog! I LOVE LOVE LOVE my readers! Thanks! I love the color scheme of the stockings–so wintery. As always your ideas are clever and inspiring! Blessings. Genius!!!! Thank you so much for sharing this “So easy” Idea!!!! 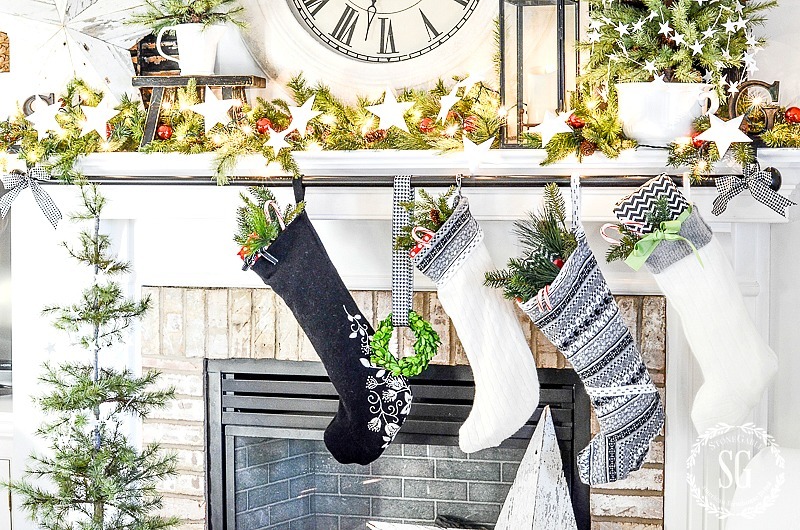 Ok, I really want to do this – if my husband will let me put holes in the mantel area – love this – looks really nice – I love the black/white too – actually you gave me the idea that will look great in my kitchen too (black/white check ribbon, etc.) – thank you. Linda, NO HOLES INVOLVED! Go back and read this again. I think you misunderstood! Hang the curtain rod from a stocking holder. No holes, no patching and no painting! So cute. I will be using your idea for hanging stockings this year at my house. Thank you. I love this idea, I have 2 red curtain rods , that I just took down from my kitchen because I put blinds up instead. I already had stocking hooks on the ends that I slid one of the rods in. I can’t wait to hang my stockings now! Love the hanging of the stockings idea. 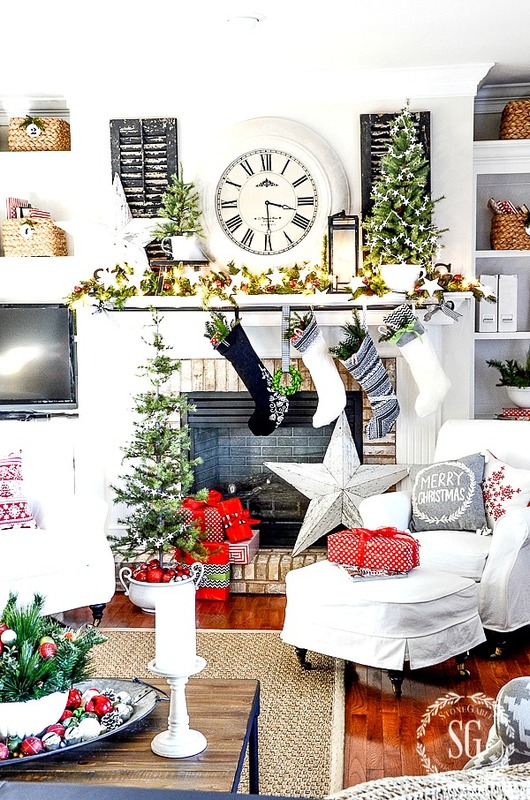 I love your fireplace Christmas decorating ideas! I am always looking for ideas to help my sad mantel look more festive! I really enjoy getting your blog emails everyday! I am always excited to check my inbox! Love this idea! And the sweater stockings are wonderful – I love thick stockings! I am always a little nervous about hanging stockings from the mantle while our gas logs are on, but I believe I’ll be able to hang them on the sides with no problem. Thanks for sharing! The beauty of the curtain rod is that you can move the stocking to the side when the fire is lit! This is genius!! Definitely using this idea. Thank you! Love everything you do’! Great new idea thank you for once again sharing! I used the curtain rod trick this year! It’s brilliant. I still do stickings for my kids and grandkids. We have 13 total! That’s a lot of stockings! But it is usually the favorite part of Christmas morning. Love the idea as well as the stockings. What a wonderful idea……..just printed several of your recipes, made a grocery list and will begin making them. Never disappointed in your recipes. Such a smart and clever solution! I am sending this to my daughter. You are so creative! And smart! That is an awesome way to hang a stocking!! Kudos and Merry Christmas! I can’t stop staring at those gorgeous stocking! Like you, I love black and white……and hanging the stockings on a curtain rod is brilliant! That idea was BRILLIANT!! LOVE HOW IT LOOKS. You are so creative and I love to read your post. Yvonne, your creativity never stops to amaze me. I’m passing this on to my children to use in their homes. They’re families of five with one or two dogs so this would work magnificently. 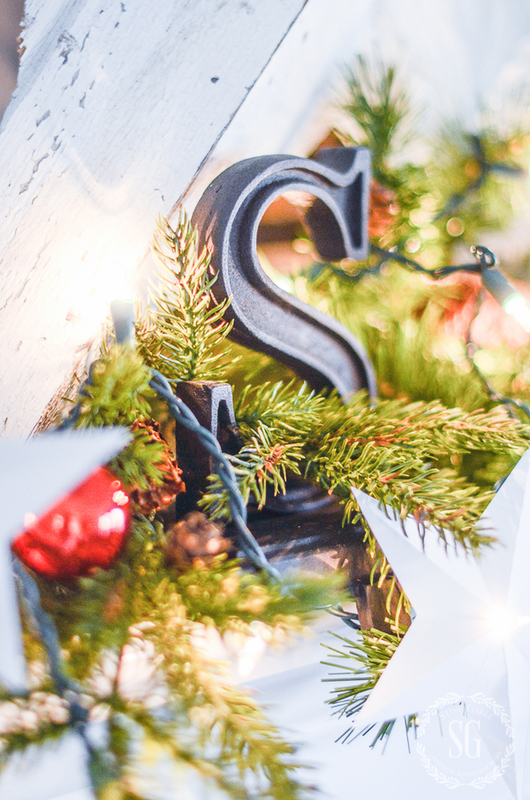 I’m kicking myself for giving away two bronze stocking holders with a star hanging from them. A little spray paint, a spare curtain rod and voila, I could recreate this while drinking my morning coffee. Where is your previous grandson’s cute little stocking? I just know it will be special. I know what you mean about kicking yourself! I do that all the time! You are the best!! Your creativity over flows. Now if I had a mantle. I always look forward to your next post. You make my day brighter. Thank you. Merry Christmas. Brilliant and beautiful! Thanks for sharing this idea. As soon as I saw your post this morning, Yvonne, I just about had heart failure (!!) as I thought you had drilled holes into your lovely mantel! lol! This is a GENIUS idea of yours … like you, I’ve never seen a decent looking stocking hanger. The Pottery Barn “Initial” ones are so stylish, however, and I wouldn’t hesitate using those if I was hanging stockings. I also love the reused sweater idea; they are also very stylish and you can’t beat the price! This is an ingenious idea!!! I was short a stocking holder for my daughter’s fiancé, and couldn’t find a match to it anywhere. This is the greatest solution. Thank You and A Blessed Merry Christmas to You and Yours! I wish I had a mantle…….but the idea will work great with what I do have! Thanks for supplying us with all these innovative ideas! I’m taking to heart your suggestion about deciding on next year’s theme — by choosing a color. I’ve decided I’m going with a green color scheme next year for Christmas. There are so many shades to choose from, that coordinate well together and with other colors. I love how you are thining ahead Kristy! Genius! Forty seven year old problem solved! How creative…looking forward to your sweater stocking instructions! Great idea! I’m going to go to goodwill myself and find some sweaters! I’ve been using this technique for several years now. It’s made hanging and filling stockings much easier. My stocking hangers must have a deeper/longer hooks because I hang my rod right from the hook. I’ll keep the zip tie idea in mind if I ever need to buy new holders. Merry Christmas! Clever way to able to hang several stockings! Like this very much! Thanks for sharing…..
You always come up with such amazing ideas! Thanks, Yvonne! That is amazing Yvonne. I love it and can’t wait to try it. Wow, what a brilliant idea! Thanks Yvonne!! Totally awesome idea. We have just added a 150 yr old mantel and I don’t want anything to add holes. I will definitely use this! Thank you for all your great posts. I love them. I just did this last week! I have 11 stockings so had to try! Works great! I love this idea; I saw something similar for sixty dollars at one of the name brand stores. This is so much better; I can match my décor for a fraction of their price. I love your home at Christmas (and all year). P.S. I can’t wait for the night home tour!! Hi Andra, I think Christmas Nights is my favorite post of the entire year! What a clever way to use a curtain rod. Your brain is constantly in the ideas mode. What a clever and practical idea – so easy to add more stockings to it as the family grows too! The fact that it’s not permanently installed is a bonus. It can be removed and put back anytime it’s needed again – say for Easter even or any theme decorating. This is my favorite idea of the season – I didn’t want to place hooks in my mantle, etc. so this is just perfect. I do like your stockings and look forward to seeing how you made them. Thank you! Merry, merry Christmas! You never cease to amaze me! What a super idea! I made a ladder to hang the kids and grandkids stockings on, but need somewhere to hang the fur baby’s. I am definitely going to do this! THANK YOU FOR ANOTHER GREAT DECORATING TRICK! Kelli, LOVE the idea of a ladder too! I always appreciate all the hard work you put into your holiday posts. So many hints and ideas. Thank you. You are so creative…thank you! what a wonderful way to display the stockings, love it. Or a wreath in the summer when the fireplace is not in use. Oh I love the idea of using a curtain rod to hand the stockings. What a great idea! I have the very oil bronzed rods over both windows so that would tie in nicely with what I already have. Wow Yvonne ,what a great idea to hang the stockings with care on the mantle. I use command strips under the onate plate rail in our dining room. The strips do not affect the finish on the woodwork. I wish I had a fieplace to cozy up to on cold winter nights, I guess I’ll just have to enjoy pictures of your fireplace. Have great day Yvonne. You always have such great ideas that’s why I follow you. Your stockings look great on the mantel. What a clever idea and you can hang moe than stockings on the rod. I would never have thought of this trick. I love the idea of the curtain rod, very imaginative. I’ve seen stockings made from sweaters but I love the colors you used. The black and white theme is very classy, with the pops of red and green it makes for a really lovely room. Ingenious idea! Your mantel looks amazing!!!! Bravo Yvonne! That is the COOLEST idea ever! Such a clever tip here! I too struggle with how to hang our stockings. We have a beautiful mantel but enjoy using our fireplace as well. So many cute and “doable” ideas! Love them all. Brilliant idea using a curtain rod! I also love black and white, always in style!? Great idea! Your wheels are always spinning. I thank you for all your creativity!!!:-$?? Perfect!! And I can’t wait for the stocking tutorial! Ours are falling apart so new ones would be great this year!! 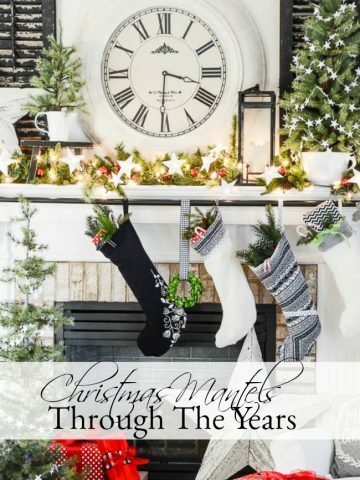 Great idea – we painted our mantle this past spring and I was so reluctant to put nails in it for the stockings ……but I did ! After the holidays I’m going to patch the holes and touch up the paint and most importantly -I’m saving this post to my Christmas idea Pintrest board for next year. Thanks for yet another great idea. All week I have been pondering this . Thanks for a wonderful suggestion. ☺ that really is the nest idea ! And those stockings. Too adorable from the sweaters. Absolutely genius!! I love the idea! This way when the family grows just add a stocking instead of hooks and rearranging hooks so they are evenly spaced. I am going to pin this. This is the type of idea where I slap my head and say, “Why didn’t I think of that?” Thank you, Yvonne. Hi Marissa, Thank you so much for your kind comment and for pinning! I LOVE my pinners! Very clever idea to use a curtain rod. I too, have made stockings from old sweaters. It is such fun to embellish in so many interesting ways. Yvonne, this is pure genius! The idea to use a curtain rod is the best tip I’ve seen anywhere! How clever. You really had your thinking cap on. Plus, I love the stockings you made from sweaters. You outdid yourself this year, Yvonne. I’m going into action using both of these ideas. Thank you so much. Wow – only you would think of that. One of those ‘why didn’t I think of that ideas’. And, why not use it through out the year to decorate the mantle for other seasons or occasions. Plan to pick up a couple of stocking hangers on sale after Christmas. I’m so glad you shared this! I don’t like the stocking holders you find today & usually if I do there’s only one or two & I need five. So going to do this today! And can’t wait for your tutorial on those stockings-I’ve been wanting to replace ours so they all match. Thank you so much Yvonne for taking time out of this busy time to share such great ideas with us all! Genius idea, don’t you just love when an idea works? Thanks for sharing.. Brilliant idea – thanks for sharing. what a clever idea . I am going to try this today!! I love this idea! My mantel is thick bevelled marble and I’ve never been able to hang stockings. I’m going to try and adapt your idea, thank you. Oh so clever!! I doubt I would have ever thought of that! What a creative suggestion! And the rod looks really nice. Merry Christmas from the NC Coast. I enjoy your blog and all the beautiful ideas you so generously share with your readers! Thank you and Merry Christmas.